The 80x50 Buildings Partnership is a collaboration between NYC’s leading building and energy stakeholders to develop smart climate change policies. 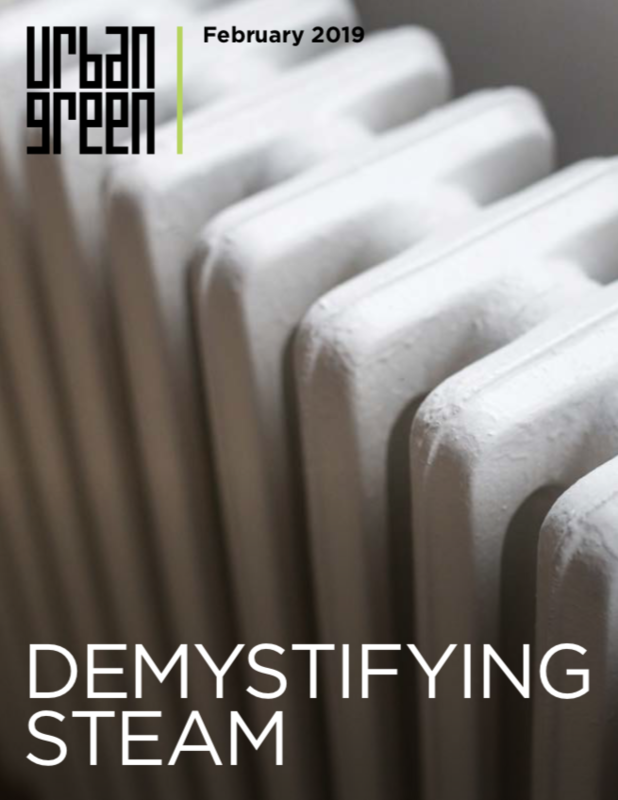 First convened by Urban Green in November 2017, the Partnership set out to develop recommendations for the City of New York on the optimal design of a building energy reduction policy. Existing buildings are the biggest piece in the New York City carbon pie, representing nearly 70 percent of emissions. Their energy use must be addressed in order for NYC to meet its target of 80 percent carbon reductions by 2050. Reducing energy use in the city's largest buildings—those over 25,000 square feet—is an effective first step, as they account for nearly 60 percent of NYC building area. 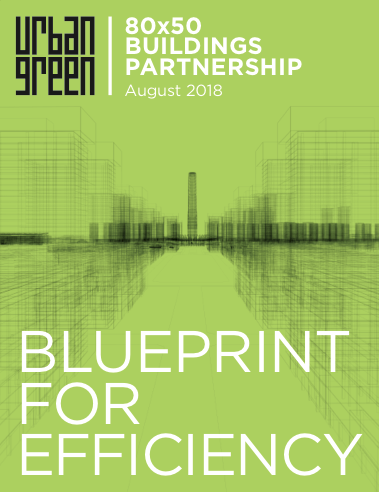 Recognizing the need for extensive dialogue to develop the most impactful and thoughtful policy, Urban Green brought together more than 40 organizations under the Partnership. The group tackled the complex questions bearing on this challenge, including costs, technological feasibility, health impacts, industry expertise, state policy and more. We also shared our findings with the City Council along the way. Following successful approaches from the Green Codes Task Force and Building Resiliency Task Force, we organized the project around diverse working groups. 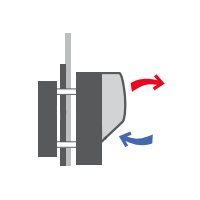 Work progressed through different phases: defining the problem; determining and assessing the options; and refining recommendations. The Blueprint for Efficiency was issued in August 2018. 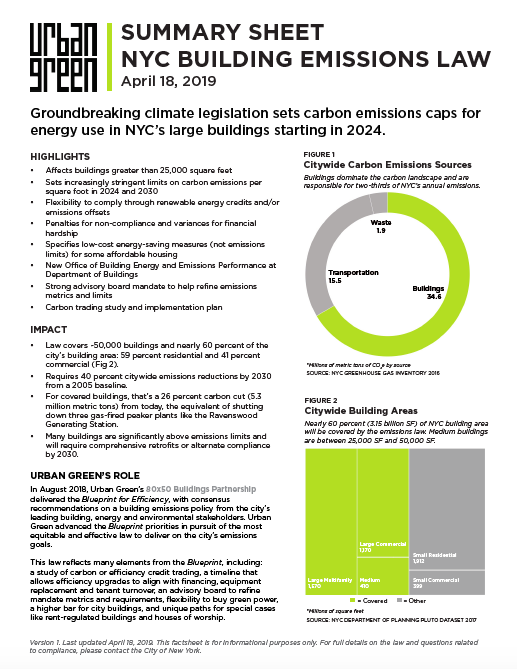 In April 2019, New York City Council passed the most ambitious climate legislation for buildings enacted by any city in the world. This new landmark law reflects many elements from the Blueprint, including: more feasible timelines, a green power purchase option, a provision for carbon trading, and future refinement through an advisory board process. With a focus on reductions that can and should be achieved by 2030 to put NYC on a plausible trajectory to 80x50, the Blueprint will continue to help inform and shape policy that works for all and sets a model for cities across the nation. If you have questions, comments or would like more information, please contact info@urbangreencouncil.org. The Partnership's first report introduces an ambitious, 21-point plan to reduce NYC bulding energy use 20 percent by 2030. Local Union No. 3 I.B.E.W.